Impeachment is a process whereby accusations are brought against a civil official by a legislative body. Legally, the term applies only to an indictment, but in practice it often refers to the actual trial of the accused. Article IV, section 4, of the North Carolina Constitution specifies that the State House of Representatives has the power to impeach and the State Senate serves as the court for impeachment. When the governor or lieutenant governor is impeached, the chief justice of the state supreme court will preside. A two-thirds majority is required to convict. The only North Carolina governor to be impeached as of the year 2006 is William W. Holden. In 1870, following the murder of a Republican officeholder in Alamance County and a state senator in Caswell County, Holden declared martial law in the two counties and put them under the command of Col. George W. Kirk. A number of individuals were arrested, and both Kirk and Holden refused to recognize writs of habeas corpus issued by state judges. 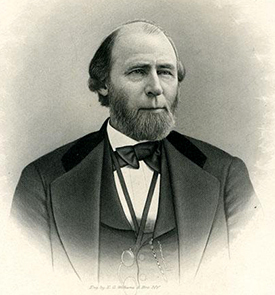 When Josiah Turner Jr., publisher of the Raleigh Sentinel, wrote a scathing criticism of the governor in which he dared Holden to arrest him, Holden complied. Soon after, a federal judge issued a writ of habeas corpus requiring that the prisoners be brought before him. President Ulysses S. Grant, who had supported Holden's actions to this point, now ordered him to obey the writ, and the so-called Kirk-Holden War came to an end. When Democrats regained control of the State House in 1870, impeachment proceedings were begun, although the decision to do so was opposed by some Democrats, including U.S. senator Zebulon Vance. Holden faced eight counts of malfeasance; he was convicted of six of the eight and was removed from office. Vance remarked: "It was the longest hunt after the poorest hide I ever saw." 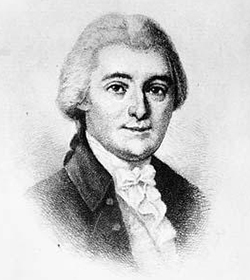 In framing the U.S. Constitution, the procedure for impeachment of government officials was first proposed by Hugh Williamson, one of North Carolina's signers of the Constitution. The terminology and procedures agreed upon were based heavily on English common law. The first person to be indicted under the impeachment clause of the U.S. Constitution was William Blount, another signer of the document from North Carolina. Blount, who at the time of his impeachment was serving as a U.S. senator from Tennessee, was charged with a high misdemeanor when it was discovered that he had written a letter proposing that Indians and frontiersmen attack Louisiana and Spanish Florida. The proceedings were dismissed by the Senate following Blount's expulsion from that body. Another native North Carolinian impeached on the federal level was Andrew Johnson-the seventeenth president of the United States and a native of Raleigh, although his political career was primarily in Tennessee. Following the Civil War, Johnson found himself at odds with the Radical Republicans in Congress, who wished to impose strict requirements on the southern states for reentry into the Union. Johnson attempted to thwart them through civil and military appointments. When Johnson, in 1868, removed Secretary of War Edwin Stanton from office, Republicans claimed that the president had violated the newly enacted Tenure in Office Act and began impeachment proceedings. The Radicals demanded that all Republicans in the Senate vote for conviction, but six refused to do so. The final vote was 30 in favor of conviction and 19 against it, just one vote shy of the two-thirds majority needed to convict. Johnson was acquitted and remained in office. Buckner F. Melton, The First Impeachment: The Constitution's Framers and the Case of Senator William Blount (1998). North Carolina General Assembly. "North Carolina General Statutes: Chapter 123: Impeachment." http://www.ncga.state.nc.us/gascripts/statutes/StatutesTOC.pl?Chapter=0123 (accessed December 5, 2012). "The Impeachment of Andrew Johnson." Harper's Weekly. HarpWeek, LLC. 2005. http://www.impeach-andrewjohnson.com/ (accessed December 5, 2012). Volume 2, Illinois: The University of Chicago Press. 1987. http://press-pubs.uchicago.edu/founders/documents/a1_2_5s13.html (accessed December 5, 2012). "Photograph, Accession #: H.1947.72.5." 1940-1947. North Carolina Museum of History.